PANAMA CITY BEACH, Fla. – The death toll from Hurricane Michael rose to at least 29 on Tuesday as crews scoured debris for hundreds of people reported missing in the Florida Panhandle, nearly a week after the storm flattened whole communities. One of the most powerful storms ever to hit the continental United States, it has killed 20 people in the Florida Panhandle, five in Virginia, three in North Carolina and one in Georgia, according to a Reuters tally of official reports. Teams from the volunteer organization were searching for more than 1,135 people in Florida who lost contact with friends and family. Debris and downed trees and power lines have hampered access to stranded people but the group has said a number of its missing person reports resulted from widespread phone and power outages. “The hardest hit in disasters are generally our most vulnerable populations,” Marchetti said. 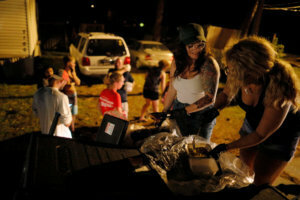 In nearby Mexico Beach, another hard-hit coastal town on the Florida Panhandle where rescue workers were using dogs to look for bodies buried in debris, the number of people missing dropped to three on Tuesday, said Rex Putnal, a city councillor. A day earlier, it was more than 30. The town of 1,200 residents had reported two fatalities as of Monday.